​Are you interested in improving your property while benefiting water quality? The Campbell County Conservation District (CCCD) and the Donkey Creek Watershed Steering Committee are offering financial assistance for projects that will benefit water quality within the Donkey Creek Watershed. The CCCD is offering funding for land owners to implement conservation Best Management Practices (BMPs) on their lands. Projects may include fencing/ stock water development to minimize access to water bodies, relocating corrals or animal feeding areas away from water bodies, or replacing failing septic systems to eliminate accidental sewage discharges.This cost share program has been made possiblethrough Federal and State grants, aimed at reducing E.coli concentrations in Donkey and Stonepile Creeks. ​AM I IN THE PRIORITY AREA? what types of projects area ELIGIBLE? Projects may include installing riparian fencing/ stock water development to minimize access to water bodies, relocating corrals or animal feeding areas away from surface water, replacing failing septic systems to eliminate accidental sewage discharges, and Improving streambank and/ or channel stabilization. The amount of cost share available for each project varies. Projects ranked as high priority may receive up to 70% cost share. If you are interested in cost-share funds through the District’s water quality improvement program, you are highly encouraged to see if you are qualified. You can fill out a self evaluation form from the "Documents and Forms", tab bellow, to see if your septic system or Animal feeding Operation project is eligible for cost share funding. Keep in mind, there are a series of steps that must be followed to make these projects a reality. Click 2013_wqd-wpp-nonpoint-source_livestock-wildlife-best-mangement-practice-manual.pdfhere to view a detalied list of Livestock and Wildlife Best Managment Practices. This could include a phone call/email or could be more formal such as submission of the project application or a self-assessment. The CCCD staff is available to assist the landowner with completion of the self-assessment and/or the project application. Depending on the complexity of the project and whether engineering/surveys are needed, there may be some technical work that needs to be performed before the actual application is submitted; however, a signed application will be needed before development of the contract. CCCD will use project ranking sheets to determine the project priority in relation to other project requests, proximity to surface water and available funding/assistance. The funding that CCCD provides comes from federal and/or state grants that have certain requirements. CCCD is required to submit a project description and location to the Wyoming Department of Environmental Quality and other granting agencies for authorization to use the funds on a specific project. In addition, CCCD is required to submit the same information to the State Historic Preservation Office for a cultural resource clearance. These agencies have 60 days to respond; it is better to submit these as early as possible. 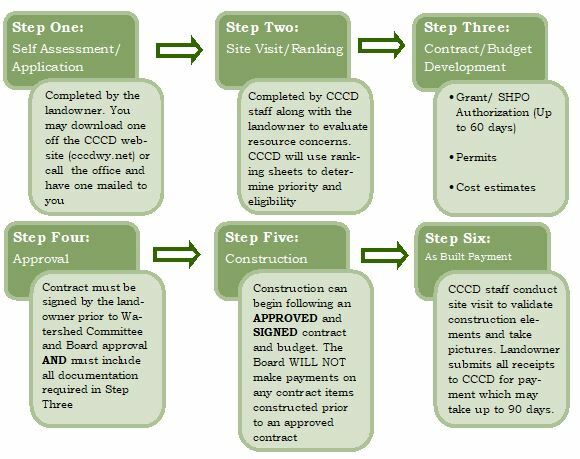 Based on resource concerns, site conditions, and landowner preferences, CCCD (with assistance from NRCS) will develop a project plan that identifies what practices will be completed and where. Developing and modifying alternatives to meet landowner and program goals can sometimes be a lengthy process . 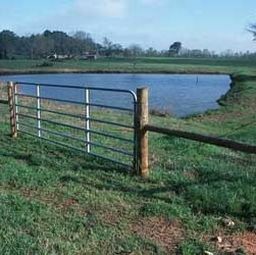 Landowner secures and/or verifies necessary permits, easements, water rights, etc. Wells or other permits for water sources must be submitted to the appropriate agency; any instream construction will require a turbidity waiver from WDEQ. All of these need to be submitted by the landowner. For septic system and/or sewer projects, the landowner (or their contractor) must submit a permit application to Campbell County or the City of Gillette. The permit application will require excavation of a test pit and percolation tests and also includes the size/design information. An approved permit is required for CCCD to develop the contract/budget. CCCD will allow costs associated with preparation of the permit application to be retroactively included as part of the landowner match for the project. Other construction activities MUST wait until after a CCCD contract is signed. For other projects, costs associated with engineering plans/designs and permits will be discussed on a case by case basis and an eligibility determination made by the Board and Watershed Steering Committee. For construction/projects (other than septic projects) that will be completed by a contractor, the CCCD requests a minimum of two cost estimates to use in contract/budget development. For materials/labor that the landowner will complete themselves and without a contractor, CCCD will base the budget on the NRCS Payment Schedule and may make adjustments in consultation with the landowner. For septic projects, where the landowner has already worked with a contractor for the excavation of the test pit and percolation tests, CCCD will accept one cost estimate. However, CCCD may request a second estimate if they feel one is needed. A contract needs to be signed by the landowner and the Board prior to ANY project construction. CCCD staff will use all of the provided information, designs, cost estimates, to develop the budget and contract. Once the contract has been approved and signed, the landowner can start project construction. The landowner can use any contractor, even one that did not submit a cost estimate. However, the project payment will be limited to what was included in the budget. The landowner is responsible for communicating project objectives and requirements to contractors; CCCD/NRCS can meet with the contractor and landowner if needed. For any work not completed by a contractor, the landowner is responsible for maintaining documentation of hours and rates for any labor, equipment, etc. CCCD/NRCS does not assist in actual project construction; but may stop out during construction to evaluate progress. Upon completion of contract items, CCCD will visit the project and take measurements, photos, gps points, and other notes needed to validate measurements and construction elements for project payment. CCCD does not provide inspection for regulatory compliance. Upon receipt of the bills/documentation, CCCD will submit a reimbursement request to the funding agencies. Please note that CCCD can only submit requests once per month and if a request has already been submitted, the request will have to wait until the next month. Upon receipt of the funds from the granting agency, CCCD will make payment to the landowner at the next regularly scheduled Board meeting. Please note that this payment can take up to 90 days after CCCD receives the documents from the landowner. The landowner is responsible for making any and all payments to the contractor. CCCD is required to maintain a payment voucher for disbursements; these need to be signed by the landowner and returned to the CCCD. CCCD is also required to submit 1099 information returns to the IRS for all cost-share payments; the W-9 ensures that we have the proper information. The landowner will have to complete all of the information, including providing a social security number or Tax Identification Number. The form must be signed and returned to the CCCD.